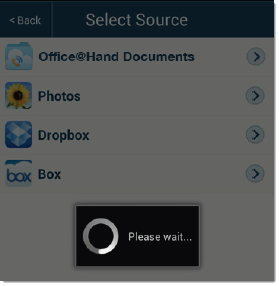 FaxOut is available to all users with the latest Office@Hand mobile app. You can now send or forward documents as fax messages to any contact anywhere on your iOS and Android-powered devices. 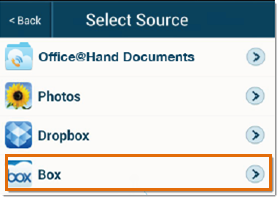 CloudFax is a feature where you can integrate your Box and Dropbox accounts to send documents via FaxOut. Launch the Office@Hand mobile app on your device. Tap the FaxOut icon on the menu bar. Select Tap to Add Document. NOTE: In this article, Box and Dropbox is used. Choose the file that you want to send. 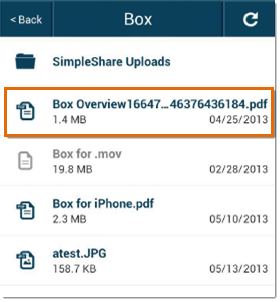 After selecting your file, you can also select other Cloud storage sources such as Dropbox. Select recipients from your contacts. NOTE: You can add multiple fax recipients. NOTE: To learn how to check the status of your outgoing fax message, click here.